The RSF-backed driver, who started fourth, took advantage of a sluggish start by front row-starter Maximilian Gunther to slot into third behind Felix Rosenqvist and race leader Stroll, who had leap-frogged both his team-mates at the start. When racing resumed after an early safety car - deployed following a string of opening lap incidents - Dennis relieved Rosenqvist of second with a dive down the inside at the Spitzkehre hairpin to chase after Stroll but was never able to get close enough to mount a challenge for the win. 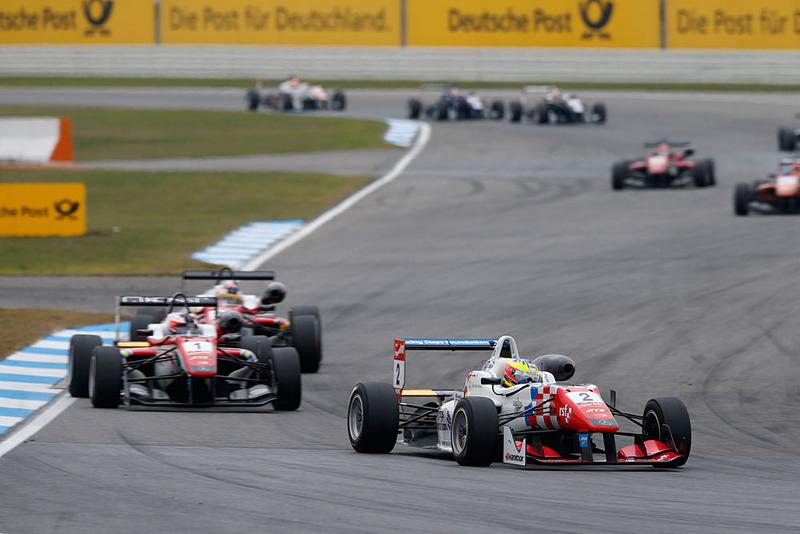 Thereafter the Prema trio, led by an increasingly confident Stroll, raced line astern all the way to the finish to lock out the podium for Prema, with Gunther following on in fourth for good measure. Dennis's fellow championship runner-up contenders Antonio Giovinazzi and Charles Leclerc finished sixth and eighth, each benefiting to the tune of two points apiece due to Hitech's fifth-placed Alexander Sims being ineligible to score. Giovinazzi, in second place in the standings, remains in prime position to claim the place on 372.5 points while Dennis remains in contention in fourth on 351, 11.5 in arrears of Leclerc in third.